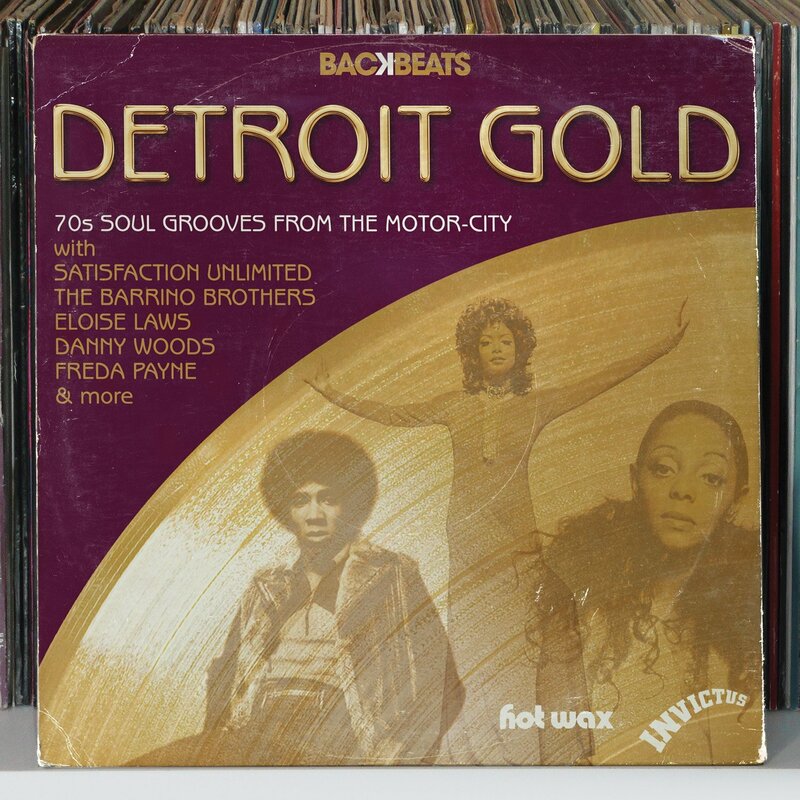 BACKBEATS-DETROIT GOLD-70S SOUL GROOVES FROM MOTOR CITY. After becoming embroiled in a dispute with Motown Records during 1967, the songwriting and production team of Lamont Dozier and brothers Eddie and Brian Brian Holland left the label in 1968. Motown sued Holland, Dozier, Holland, who countersued Motown. Like all litigation, things were getting messy and expensive. Motown played hardball. This is no wonder, after all, they were losing one of their most successful songwriting and production teams, who provided hits for The Four Tops and Supremes. However, during this dispute, Holland, Dozier, Holland were unable to write their own material for the best part of a year. With one eye to the future, Holland, Dozier, Holland decided to set up two new labels, Invictus and Hot Wax. While Holland, Dozier, Holland set up Invictus and Hot Wax, there was one problem looming on the horizon. Due to the legal dispute with Motown, they were unable to write their own material for the best part of a year. Despite being legally unable to write new songs, they found a way around this. They used pseudonyms. Nowadays, this wouldn’t wash. They’d have found themselves back in court on a charge of contempt of court. Things, however, were very different back then. So legally, all Holland, Dozier, Holland could do was production. Now given they were one of the best production teams of that time, this wasn’t exactly a hardship. Despite their indisputable track record of critical acclaim and commercial success, the naysayers wondered whether Holland, Dozier, Holland could replicate their earlier success at Motown. Critics wondered whether Holland, Dozier, Holland could make it on their own? Their doubters and critics wondered whether Holland, Dozier, Holland could only prosper within the rarified confines of Motown. Soon, Holland, Dozier, Holland had defied their critics, and were producing and later, writing scores of hits for artists. Freda Payne, Chairman of The Board, Eloise Laws, The 8th Day and 100 Proof (Aged In Soul) all gave Holland, Dozier, Holland the critical acclaim and commercial success they’d enjoyed at Motown. They’d proved their critics wrong and were back, where they’d been before the bitter litigation began, at the top. Now, as part of Harmless Records’ long running and commercially successful Backbeats’ series, Detroit Gold, which will be released on 25th March 2013, looks back at Holland, Dozier, Holland’s invictus and Hot Wax labels. There’s all the big names, plus a few lesser known names, including the hugely talented Barrino Brothers. Detroit Gold is a fitting reminder of one of the most innovative, talented and respected songwriting and production teams in the history of soul music…Holland, Dozier, Holland. Indeed, Detroit Gold, which features sleeve-notes by Dean Rudland demonstrates that for Holland, Dozier, Holland, there was life after Motown, which I’ll now tell you about. Of all the artists on Detroit Gold, one artist features more than any other..Freda Payne. That’s understandable, given the success she brought to Invictus. There are four tracks from Freda on Detroit Gold. This includes her 1970 single Deeper and Deeper, which like Happy Heart featured on Freda’s most successful album Band Of Gold. It reached number sixty in the US Billboard 200 and number seventeen in the US R&B Charts. The other two tracks are her 1973 single Two Wrongs Don’t Make A Right and the B-side We’ve Got To Find A Way Back To Love. Both tracks featured on her 1973 album Reaching Out. Of the four tracks, my favorite is the sultry Holland, Dozier, Holland penned Two Wrongs Don’t Make A Right. Another of Holland, Dozier, Holland’s most successful signings to Invictus were Chairmen of The Board. They released four albums between 1970 and 1974. Their most successful single was the million-selling Give Me A Little More Time. Let Me Down Easy was a single they released in 1972, failed to replicate this success. It has Chairmen of The Board’s unmistakable sound and features an impassioned, pleading vocal from General Norman Johnson. Truly, it’s a deliciously soulful hidden gem from the Invictus back-catalogue. General Johnson, the lead singer of Chairmen of The Board also released one solo album on Invictus in 1972. Entitled, General Johnson, it this marked the start of his solo career. On Detroit Gold are two tracks from the album, I’m In Love Darling and the 1973 single Only Time Will Tell, which marked a soulful start to the Grammy Award winning songwriter’s solo career. 100 Proof Aged In Soul have a trio of tracks on Detroit Gold. They released two albums for Hot Wax between 1971 and 1972. Their first contribution is their 1971 single 90 Day Freeze (On Her Love). Then there are two tracks from their 1972 sophomore album 100 Proof. This includes Nothing Sweeter Than Love and Everything Good (Is Bad), which were both released as a single. So good are the three tracks, that choosing the best isn’t easy. If pushed, I’d have to chose Nothing Sweeter Than Love where Steve Pancha’s vocal veers between testifying and tenderness, but is always laden with emotion and satisfyingly soulful. Honey Cone were a female soul trio discovered by Eddie Holland. Their breakthrough singles was Want Ads. After that, they released four albums for Hot Wax between 1970 and 1972, before disbanding in 1973. Four of their tracks feature on Detroit Gold. You’ve Made Me So Very Happy features on their 1970 debut album Take Me With You. The Day I Found Myself was released as a single in 1971, and features on their 1971 sophomore album Sweet Replies. A Woman’s Prayer is the best of the quartet and is from their 1972 album Love, Peace and Soul. It features a truly impassioned, sincere vocal, complete with cooing harmonies, lush strings and sultry saxophone. Their other contribution to Detroit Gold is The Truth Will Come Out, which was the B-side to 1976s Somebody Is Aways Messing Up A good Thing. Eloise Laws came from a family with a rich musical pedigree. Her brothers were flautist Hubert and saxophonist Ronnie. Tighten Up, which was released as a single in 1972 on the Music Merchant imprint, demonstrated that Eloise shared their musical genes. Then when Music Merchant folded, Eloise signed to Invictus, where she released her 1977 debut album, Ain’t It Good Feeling Good. By now disco was at the height of its popularity, and music had changed since Tighten Up was released. Which of the two tracks you prefer, will be up to your musical preferences. Satisfaction Unlimited only ever released one album Hot Wax, 1972s Think Of The Children. Two of their tracks feature on Detroit Gold, including their debut single Bright City Lights. It has a lovely laid-back, Latin tinged sound as soul and funk unite. Quite simply, compiler Dean Rudland deserves credit for sharing such a beautiful track with us. As an added bonus, Let’s Change The Subject is also included. Once you’ve heard these two tracks, you wonder why they Satisfaction Unlimited didn’t enjoy the commercial success their music deserved. The same could be said of The Barrino Brothers, from North Carolina. Two of their tracks feature on Detroit Gold, but as is often the case, quality music didn’t equate to commercial success and critical acclaim for The Barrino Brothers. They only released three singles, including the defiant I Shall Not Be Moved, released in 1971 and Trapped In Your Love and one album, 1973s Livin’ Off The Goodness Of Your Love. While commercial success and critical acclaim eluded The Barrino Brothers, their legacy is some timeless, soulful music. Of the three other tracks on Detroit Gold, Silent Majority’s 1971 single Something New About You is the best of the trio. Produced by Ronald Dunbar, this was Silent Majority’s second single for Hot Wax. They may not have been Holland, Dozier, Holland’s most successful signing, but they certainly weren’t lacking in talent. Danny Woods was taken under Holland, Dozier, Holland’s wing. For Aries, his 1972 release for invictus, Holland, Dozier, Holland produced the album, and cowrote several tracks, including the emotive and heartbreaking Two Can Be As Lonely As One. The final track from Detroit Gold is The 8th Day’s Just As Long. This was a track from their 1971 debut album 8th Day, which was the first of two albums they released for invictus. Although their lineup is best described as fluid and in a state of constant evolution, The 8th Day didn’t disappoint on their two Invictus albums. While many compilers would’ve trodden a familiar path when compiling Detroit Gold, and chosen the label’s biggest hits, that’s not the case here. They’ve been bold not just in his choices, but his omissions. Dealing with the omissions first, Dean’s chosen neither to include Freda Payne’s Band Of Gold nor Chairmen Of The Boards’s Give Me A Little More Time. To me, this makes sense. After all, look through you record collection and you’ll discover it’s a favorite of compilers during the past thirty years. By eschewing two obvious tracks, he’s made way for two lesser known tracks, including Freda Payne’s Chairmen Of The Board’s Let Me Down Easy. As for the inclusions, all the artists who played their part in making Invictus and Hot Wax successful labels are there. This means Freda Payne, Chairmen of The Board, Eloise Laws, The 8th Day, Honey Cone and 100 Proof Aged In Soul. So too, are less obvious choices like Danny Wood and Silent Majority. Again, the compiler has managed to strike a balance between tracks by well known artists and adding a sprinkling of lesser known names. Striking such a balance isn’t easy. Managing to do so is the difference between alienating record buyers. After all, if you stick to the lesser names, you risk losing people who are only familiar with the bigger names. Likewise, people who are familiar with Invictus and Hot Wax’s back-catalogue are always looking for rarities and hidden gems. What will really sell Detroit Gold, on its release on the 25th March 2013, is the music. Like so many other Backbeats’ compilations, it’s quality from the get-go. Through twenty-three tracks, the quality coming. Not once does his judgement lapse. Quite the opposite. Always, the quality is consistent. That’s not easy on a compilation that contains twenty-three tracks. Holland, Dozier, Holland’s critics wondered whether they could replicate the success they enjoyed at Motown with their new labels Hot Wax and Invictus. Having started again, they reached the top of the musical mountain. They managed to reach the same heights they reached at Motown. In many ways, Holland, Dozier, Holland and the music in Detroit Gold is proof that form may be temporary, but class is permanent. Standout Tracks: 100 Proof Aged In Soul Sweeter Than Love, Chairmen Of The Board’s Let Me Down Easy, Danny Woods Two Can Be As Lonely As One andHoney Cone A Woman’s Prayer. ← BACKBEATS-CROSSOVER TO SOUL-MORE CROSSOVER SOUL FROM THE 60S AND 70S. Thanks for your comments Jaffa, I’ve amended the review. I really enjoyed the Detroit Gold compilation. The Backbeats series always features some great music. The other thing I wanted to say, was that I really liked the artwork and design for Philly Regrooved 3. I wrote the sleeve-notes for the compilation. You did a great job. I’d have emailed you at the time, but didn’t have your email address. So a very belated thanks. With the Trax Box, the artwork was absolutely incredible. That would make a great poster and T-Shirt. I get hundreds of CDs and albums each year, and that’s one of the best I’ve seen. So well done for that.